CHICAGO — Broadway is neither a street, boulevard, road, avenue nor parkway. It's just Broadway — bearing the distinction of being the only one of Chicago's 2,582 roadways with no suffix. Broadway runs on the North Side from 2800 North to 6399 North. The street originally was called Evanston Avenue but was changed to Broadway in August 1913 as a nod to the road cutting through New York City's theater district, according to the book "Streetwise Chicago" by Don Hayner and Tom McNamee. That month, more than 460 other Chicago streets dropped their old names and assumed new ones, the Tribune reported. 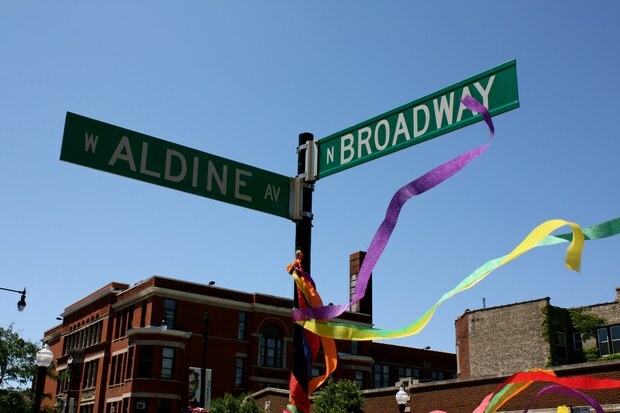 Hayner, the retired editor of the Sun-Times, isn't 100 percent sure why Broadway doesn't have a suffix, but told DNAinfo Chicago: "I believe it's just because it's a 'way' so it's not a street or an avenue, just a way." The Big Apple's Broadway is also just that, with no suffix. A 1927 Tribune article said the name change was because "saloon keepers on the street thought Evanston suggested the dry town to the north." Shortly after the 1913 name switch, the Tribune's G.T. Bindbeutel called Broadway "the sauciest territory in Chicago." "Effect of environment accounts for the breezy, happy go lucky, chummy dispositions of residents of this ecstatic, illuminate patch of the city," Bindbeutel wrote. "It is safe to say that redskin maids and braves felt a maximum oglish (sic) thrill when, a hundred years ago, they met in the solitude where Broadway later was to swish northward zig-zaggedly like the streak of lightning it is trying to emulate." The move also prompted a North Side church to switch its name. The Evanston Avenue Methodist Episcopal Church would become the Broadway Methodist Episcopal Church in 1914. The name was switched to Broadway United Methodist Church in 1969. "Evanston avenue has always been rather a confusing name," church member John R. Willott told the Tribune in 1913. "Strangers thought that we were located in the city of Evanston, instead of Chicago. ... We certainly have no objection to the new street designation of Broadway."